Residents at a city apartment block have vowed to fight back against a vulture fund's demands that their homes be sold. A number of residents at The Strand apartments in Co Limerick have gotten letters telling them to leave their homes within months. 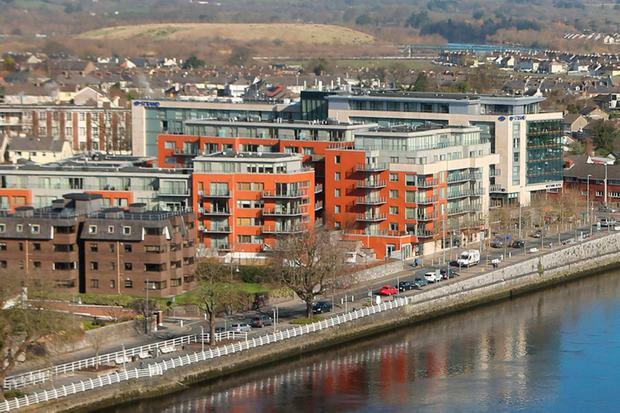 The letters, one of which has been seen by the Irish Independent, were sent on behalf of Sova Properties Ltd. It warns the resident that their tenancy will expire in April and that "the reason for termination of the terms of the tenancy agreement is due to the landlord intending to sell the dwelling within the next three months". Sova Properties Ltd is a subsidiary of Lalco Holdings Ltd, which was previously in charge of the apartments. Sova had, according to its latest filed accounts, net liabilities of €64m and bank loans of €118,407,352. This debt was transferred to Nama in August 2010, prior to Nama selling the loans to Oaktree Capital Management in July 2016. According to Sova Property Ltd, it was then directed by Oaktree to sell the apartments by vacant possession. Resident Tara Robinson is among those who have vowed to fight back. Ms Robinson (43) got her letter just before Christmas. "It explained the apartments were going to be sold by June 2017, and that they were not going to be sold with any tenants in them," said Ms Robinson. "Basically they would all be sold through auction to the highest bidder, so they could make as much money from them as possible." It is understood at least 25 of the 120 apartments in question have been sold. "[Last November] the reserve price was €165,000 for a one-bedroom apartment, which later sold at auction for €215,000," she said. However, Ms Robinson noted that the apartments were originally sold "for €315,000 off the plans, back in the boom times". Ms Robinson, who said she never missed the €700 monthly rent, added: "I can't believe it. I paid my rent on time throughout a horrible recession. "The fact that some faceless vulture fund now owns my home, and wants me out, and doesn't care about me, is making me really angry." Ms Robinson described the situation as "disgusting". "I'm not going to leave. They'll have to take me to court if they want to get me out. I just think it's wrong and people need to take a stand," she said. Residents, organised by AAA councillor Cian Prendiville, are joining forces to try to fight the evictions, with Cllr Prendiville having queried the validity of the eviction orders. He claimed that Department of Finance officials and Finance Minister Michael Noonan had "rolled out the red carpet for these vulture funds". He said Mr Noonan had met "with representatives of the vultures personally eight times in 2013 and 2014, encouraging them to come to Ireland. On top of that his officials met with them on 65 occasions as well". "Now the vultures have arrived on his very own doorstep, and the result is mass evictions in order to 'maximise value', the end result of which would be further massive increases in rent prices across Limerick," said Mr Prendiville. Next week, new legislation will come into effect offering tenants new protections in relation to the proposed sales of more than 10 units. But it will come too late for residents in Limerick who have already gotten their letters. In its latest filed accounts, Sova Properties Ltd stated it intends to complete the sale of all its assets "as quickly as possible" and pay off its debt to Oaktree Capital by 2020. A statement released by Sova said: "Debt secured against these properties was sold by Nama to Oaktree which has directed that Sova sell the properties to repay the debts. Sova remains in ongoing communication with tenants." Charlie Weston and John Downing Fine Gael has been accused of helping so-called “cuckoo funds” to buy up housing developments - making things even harder for families trying to buy their own home.